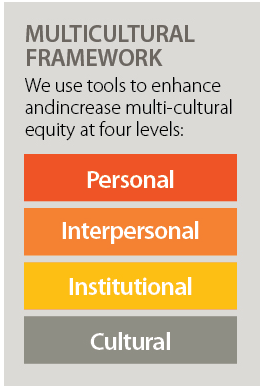 Are you needing to provide culturally relevant services to clients but don’t know how? Do you work in a tense work environment that lacks inspiration? Are your work teams isolated and underperforming? Have you been on the path to building equity in the workplace and in the community and want to move to the next level? We provide expert consultation services that support individuals and organizations to overcome these challenges. We are a multicultural consulting team with more than 50 years of collective experience supporting organizations to achieve greater effectiveness through full inclusion. We have diverse professional, educational and cultural backgrounds and experiences that allow us to effectively address our client’s needs. For fifteen years, we have specialized in building cultural competency strategies for Health and Human Services organizations and non-profits as well as educational and governmental institutions. Our services and practices are aimed at nurturing effective leadership and building collaborations between all employees across the agency, improving service delivery, and community partnerships. Learning how some dynamics at our agency were based in modern oppression and internalized oppression made a great difference. It gave us a common language that helped us address the challenges we faced. We recognized the vulnerability and strengths of each group. This helped us be more honest with each other and made our working environment much healthier.